Never give up is how I would describe this job!!! 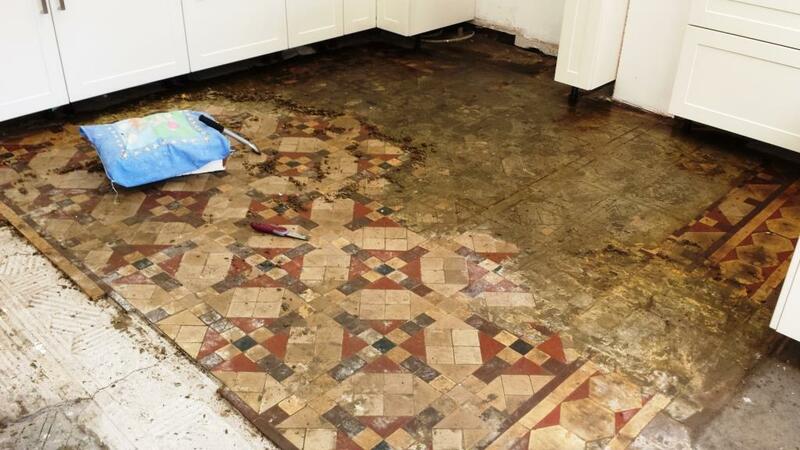 I initially surveyed the floor in this Cardiff kitchen in November 2014 and finally completed it and the end of February 2015 working on it off and on as I searched for right tiles to match the existing. 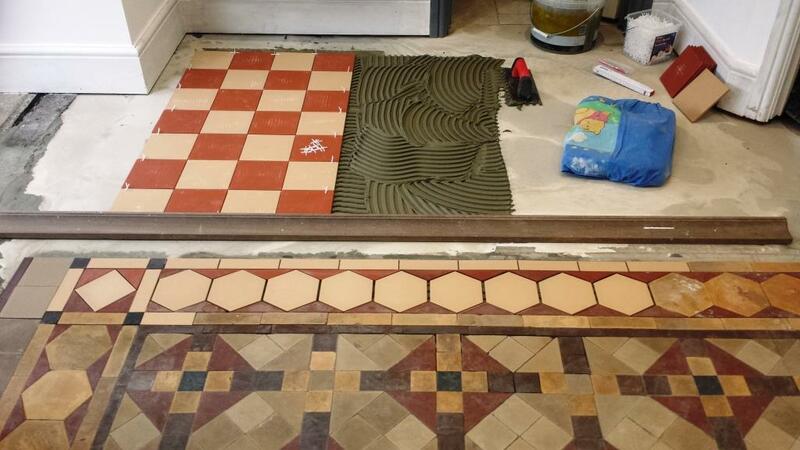 On my survey the Victorian tiled floor which the customer was hoping to restore was covered over by ceramic tiles which the customer agreed to remove before my next visit so I could carry out a cleaning sample. 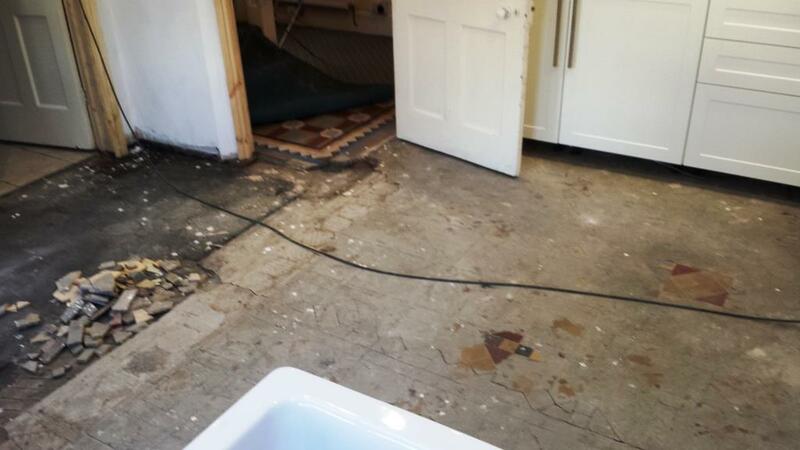 Additionally there was an area of flooring which needed to blend in with kitchen as the pantry wall that previously separated it had been knocked down. The ceramic tiles were removed and I came round to carry out a cleaning sample in what I thought was one of the more heavily soiled areas; I used Tile Doctor Remove & Go combined with another Tile Doctor product called NanoTech HBU which stands for Heavy Build-up Remover. 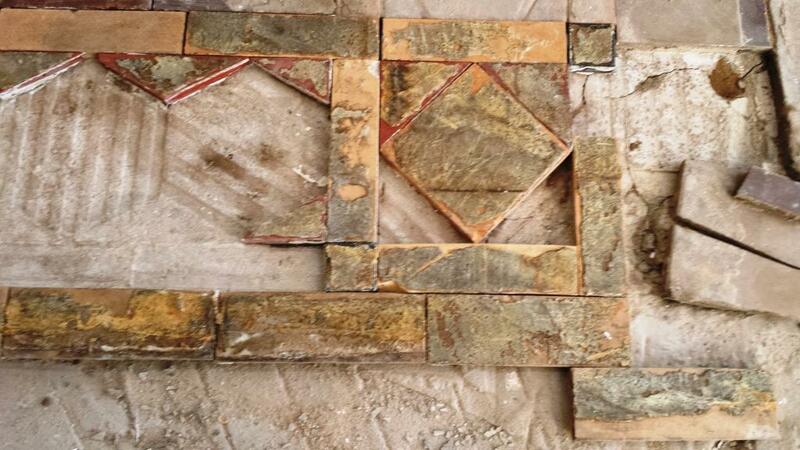 The results were successful and it was decided to go ahead with the restoration. During my visit I tested for moisture and in general the readings were good with the highest reading of 12 in different parts of the floor. To restore the tiles I set about cleaning adhesive and grime off using a combination of Tile Doctor Nanotech HBU and Pro Clean which was left to dwell and soak in for two hours before scrubbing with a rotary machine fitted with a black scrubbing pad. I tried this for a while and found it was not removing the dirt as expected and on inspection I discovered that the inner body of the ceramic tile was still stuck to the floor. It seems the when the customer removed the ceramic tiles they had only managed to remove the top layer of the tile and had left the lower part stuck to the floor. 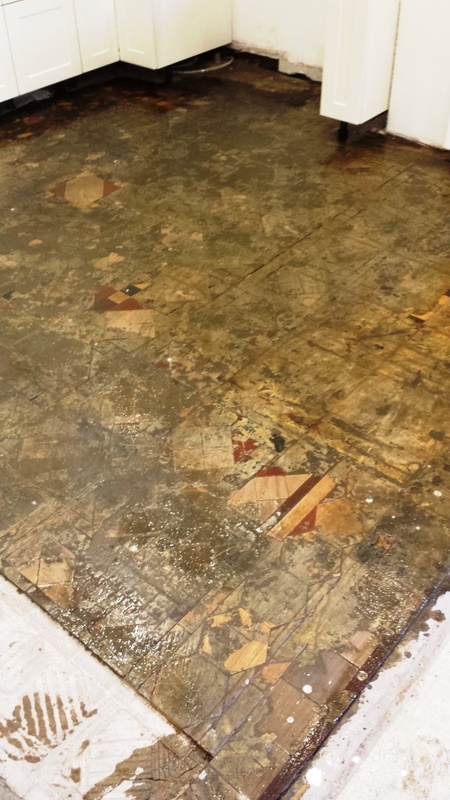 This Job was now becoming a nightmare as the solution would be to chip and scrape away tiny pieces of the remaining tile away so I could reach and clean the original Victorian floor. 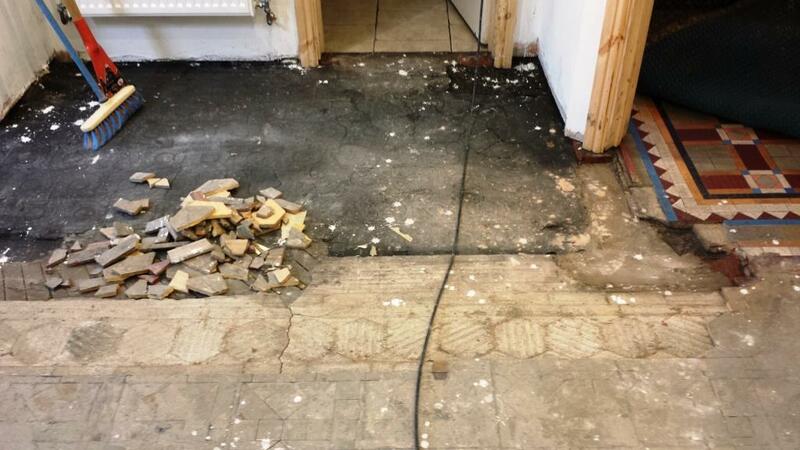 I had suggested to the customer that it might be cheaper to replace the whole floor but he was adamant that we should continue with our original plan and try to do the best job possible so never giving up I was happy to oblige. In between cleaning the floor I prepared the base adjacent to the original floor with levelling compound. Also with the cleaning in progress I was getting a better look at the Victorian tiles which were now starting to appear and I could see how badly damaged which would have to be replaced. 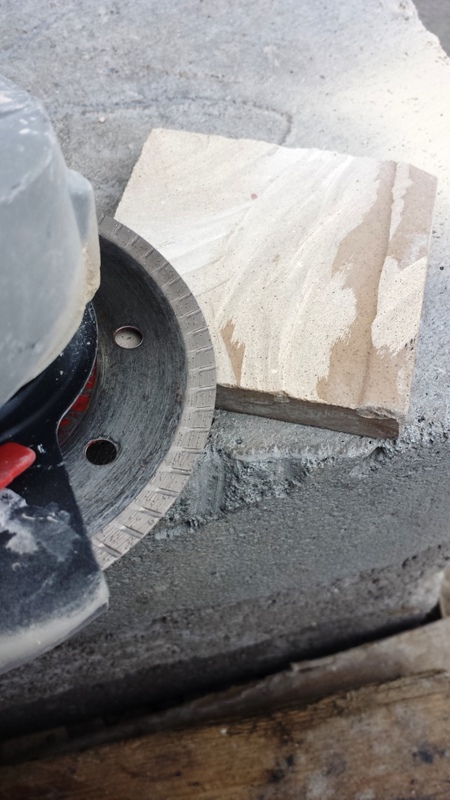 The hallway floor had to be cut at the kitchen doorway as it protruded into the kitchen which when the door was closed looked odd so the customer was happy with my suggestion. 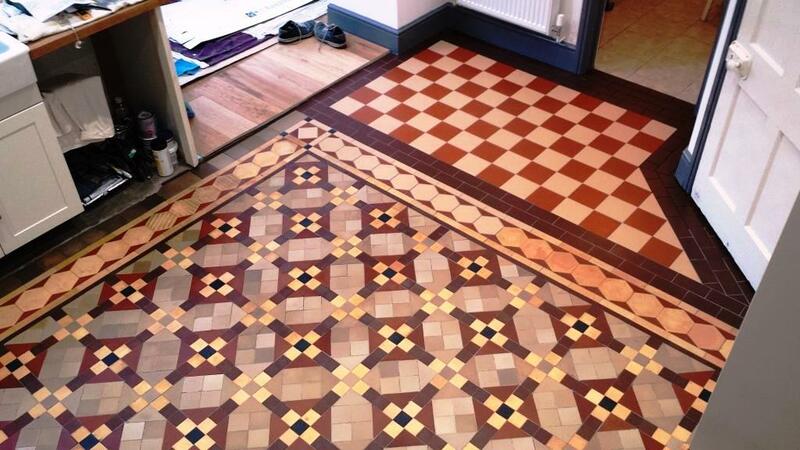 I made different suggestions for the new floor layout, and colours which we felt complimented each floor pattern , the new tiles were purchased from original style and the local reclamation yard but I did have to cut the back off a few because of different thickness. 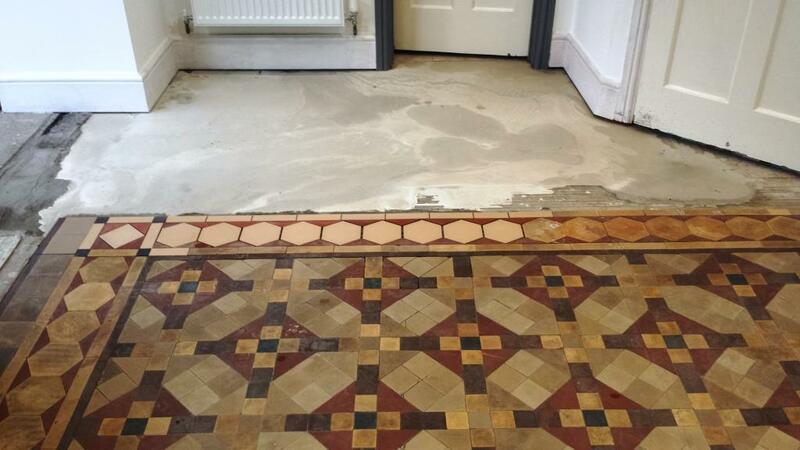 I finished fixing the replacement tiles and laying the new tiles in a pattern that we had agreed and in a style that best matched the original floor. After all the work undertaken including the tilling of the area attached to the original I gave the whole floor a final and thorough steam clean which I did on a the Friday leaving it to thoroughly dry out over the weekend so I could move onto sealing early the following week. Unfortunately when I arrived on Monday I discovered patches of efflorescence had appeared on certain tiles and I was still unable to finish the job. To resolve this the tiles needed to be given an wash down with Tile Doctor Grout Clean-up diluted 50/50 with water; this did the trick so I gave the floor another rinse with water and left to dry overnight. When I returned the next day I checked for moisture which was a borderline reading of 15-16 so using a heat gun applied some warmth to the whole floor making sure to let it cool down before sealing with a coat of Tile Doctor Colour Grow which is an impregnating sealer that occupies the pores in the tile to prevent dirt from becoming ingrained there. Next I applied three coats of Tile Doctor Seal and Go which added a nice sheen to the floor and really brought out the vibrant reds in the tile. The following day I returned to do some tiling on wall above the cooker so applied a further three coats of Seal and Go to the floor to ensure it was fully sealed. If you have read this story through to the end you will appreciate that this was a mammoth job however it was satisfying to do and the final result looks fantastic, needless to say both myself and the customer were very happy with the end result. 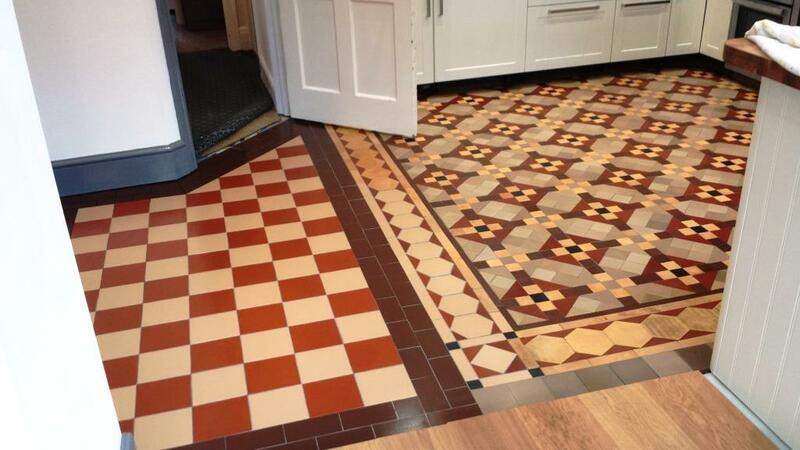 This entry was posted in Victorian Posts and tagged Cardiff, cleaning services, floor restoration, sealing victorian tiles, South East Wales, tile cleaning, tile maintenance, tiled floor, victorian floor repair, victorian floor restoration, victorian tiles by AbzDominise. Bookmark the permalink. 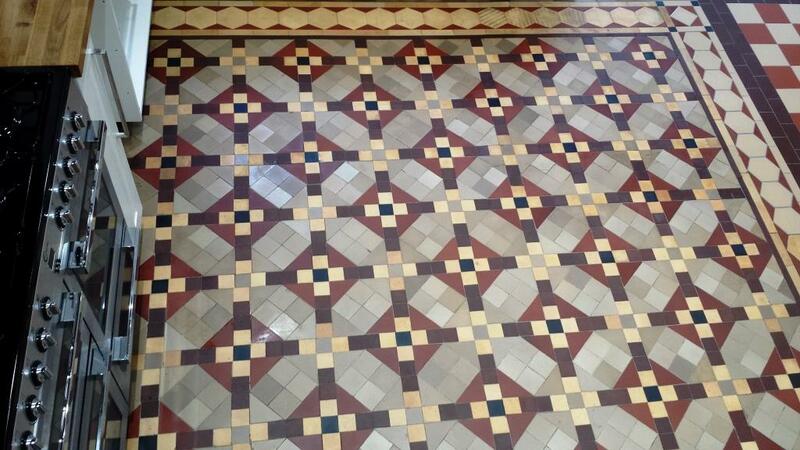 Huge job and such a quality result, Julian must be one of the top tiled floor restoration professionals in the UK.